Having the right girls lacrosse stick is crucial to your success on the field. Sure, your lacrosse goggles, cleats, and even socks are important. But your stick is your weapon on the field! The whole game revolves around your stick whether you are a middie, attacker or a goalie. We believe that you can be just as good as the best laxers ever. But it's going to take two things: Hard word, and the right girls lacrosse stick. The hard work is up to you. 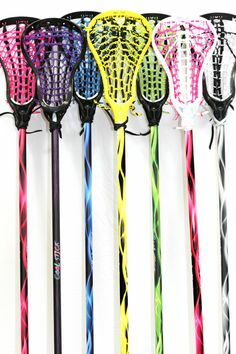 But choosing the right womens lacrosse stick is up to us. We are here to help you choose the stick that will put your hard work to good use on the field. Lacrosse is the fastest growing sport in the U.S., which means tons of girls are taking up the fastest game on two feet. The game is being played at college and high school levels. Even younger girls and youth levels are taking up the game now. That means girl’s lacrosse sticks are advancing and ever-changing, year after year. We’re here to give you the rundown on the best possible girls lacrosse sticks you can choose from for your 2018 season. Along with some new manufacturers in the market, the dominant girl’s lacrosse stick developers like Brine, STX, DeBeer, and Warrior have been producing more elite sticks to allow girl’s lacrosse players to put their best efforts on the field. As times move forward, games become more complex and the manufacturers try to keep up with these changes by modifying their products to make the best lacrosse sticks possible. Girl’s lacrosse sticks are all developed with a variety of factors in mind. Beginners sticks are developed with the basics in mind; scooping, throwing, and catching, while advanced sticks are developed with the positional lacrosse player in mind. Throughout your quest to find the perfect stick for you, we want you to keep some of these points in mind. Your sick should reflect your ability. If you are just beginning the sport, a more advanced stick probably won’t be the right choice for you. When you start playing the game, you need to go for a stick that gives you maximum cradling ability. After some practice, you can move to the advanced levels. 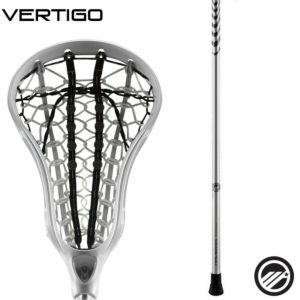 Advanced sticks are designed with more narrow channels and lower sidewalls, creating a missed opportunity for a beginner to develop their ground ball scooping ability and their cradling ability. Beginners do well with beginner or intermediate girls lacrosse sticks, giving them the best tool to learn the basics while still being a threat on the field. Vice versa, advanced players are better off with more elite girl’s lacrosse sticks, as they are designed to give the ball handler more feel and quicker releases on shots and passes. The best and most elite sticks of course come with a heftier price tag, but often for a good reason. Elite sticks are designed to last seasons, and not just a few months. The best girl’s lacrosse sticks offer the most ingenuity when it comes to sidewall design, pocket depth, and channeling. If you are playing at pro level, then you should definitely invest in a stick that will be your companion through some seasons. Not every elite girl’s lacrosse stick will be as expensive as the next, and it definitely depends on the manufacturer. You just have to skim through the products by different brands and find one that suits your needs and budget. Beginners lacrosse sticks can offer the most ‘bang for your buck,” still offering a quality stick at an affordable price. Once you have been playing for a while, some womens lacrosse sticks are preferred and recommended for certain positions over others. Obviously, goaltenders use goalie lacrosse sticks, but you’ll soon see how some sticks are developed strictly for attackers, while some are better for defenders. Girls lacrosse is different than boys lacrosse. And so are girls sticks. Today, the top manufacturers that make Brine, deBeer and STX lacrosse sticks offer the best in class gear. They all give you maximum control with the ball at an affordable price. Look for sticks with slight flex throughout the top half of the head to allow for controlled passes, quick releases, and speedy shots. The best attack lacrosse head for midfielders have a wider throat channel to naturally carry the ball in the middle to the top of the pocket. The “V” shaped head scoop work well for midfielders. Wider heads and low sidewalls along with the channeled stringing allows for an easy transition from offense to defense. If you’re an offensive midfielder, a pinched head will give you more feel with the ball and keep it nestled the pocket if you get checked. All attack girls lacrosse sticks are designed with scoring goals in mind. Maximum offset from shaft to scoop allows for control even through double teams and stick checks because of a lower side rail and pocket. A pinched head keeps the ball centered in the head and offers control through dodges and fakes but still allows for a quick catch and release. Newer methods of stringing in attacker’s sticks use recessed sidewall holes to allow for pocket movement so the ball moves with you and your cradle instead of wobbling within the head. Look for “V” point scoops, which will keep the ball continuously flying out of the same release point on shots and passes, even on a rainy day. If you need help deciding which stick to get based on your position, you can go to your coach or watch some pro level players who play the same position as you. Look for a girls lax stick that has stiffness throughout the head while offering a flattened or dropped scoop to allow maximum ground ball pickups. 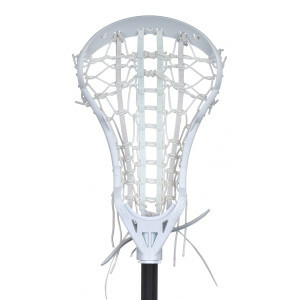 Womens lacrosse heads aimed at strict defenders have low flex points and sidewalls to allow for maximum pocket depths to increase control when carrying the ball. Though you can always restring a stick to your liking, many defensive girls lacrosse heads come with a gripper pocket which allows for more ball control throughout a variety of seasons. Wider womens lacrosse heads feature more surface area which increases a defenders chance of knocking down shots and passes in the 8 meter. Womens lacrosse sticks are usually developed with high school, collegiate, and post-collegiate players in mind. As the game progresses in skill and technique, advances in lax stick technology have been relied on to give you an edge over your opponent. The materials are higher quality, and the purposes more specific on advances girls lacrosse sticks. Different sticks are based on the position of the player, the level of durability required and the overall strength of the material used. Checkout the reviews below! 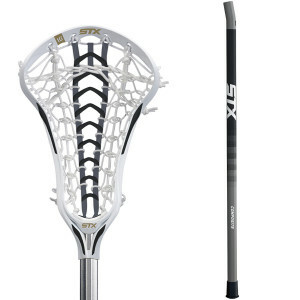 The STX Crux 500 is THE absolute best possible womens lacrosse stick you can purchase for the advanced laxers. It can be seen being used by the top women’s players in the country in colleges and universities as well as the U.S. Women’s National team. The Crux 500 is developed with 10 degree offset rail, so shots and passes get more whip and accuracy, something the advanced attacker and midfielder need. The minimal sidewall development and offset head allow the ball to sit deeper in the pocket, allowing flex and control when cradling. At just over $200, this can be a sticking point with some buyers. However, for those girl’s lacrosse players looking to really up their game, this is the stick you have to have. You don’t have to invest in this stick if you’re just starting to step into the game. But if you’re playing on higher levels, this is the most ideal stick in terms of accuracy, firmness and control. The middle model in the Crux series, the STX Crux 300 offers some of the perks associated with the STX Crux 500, without the $200 price tag. It does have the minimal sidewall and the offset rail technology to allow a deeper pocket and flex point for shooting and ball control. The STX Crux 300 is a little bit wider than the Crux 500, which makes it the better choice for the more intermediate player rather than the advanced. Since it has a wider head, it is quite effective at checking and so can be used by defenders. The Crux 300 still has the widened scoop and flex for superior ground ball pickups. 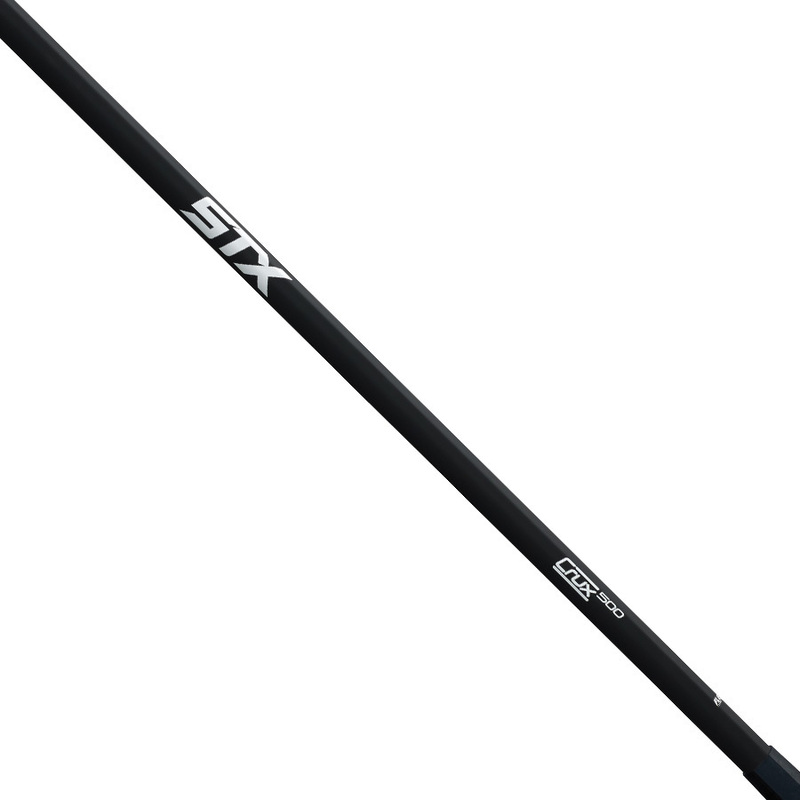 The price for the STX Crux 300 womens lacrosse stick is cheaper than the 500 at just over $130. This is the stick you want to invest in if you are still transitioning to advanced levels. It will definitely last you a few seasons and is not heavy on the pocket. The STX Exult 100 womens lacrosse stick is newer to the usual lineup, but girl’s lacrosse players are claiming they love these newly designed STX lacrosse sticks. STX prides itself on lasting longevity of sticks, creating no-tear top strings and heavy pocket construction to last for years. The center channel itself has grips that flex around the ball when it’s in your stick, creating a close bond between the center of the stick and the ball. This allows the midfielder and attacker to feel the ball when dodging and pulling back to shoot, knowing the ball is right where they want it every time. 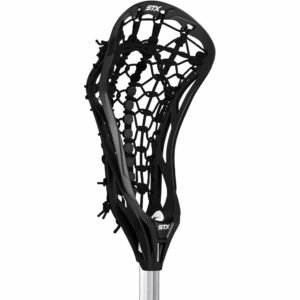 The STX Fortress is a lockdown defensive womens lacrosse stick. The head is designed to be stiff to knockdown passes and go right through ground balls in the defensive zone without flexing. The elongated stick face allows the defender to get more power on outlet passes, and the widened head allows more surface area to check. The pocket is designed for the ball carrier to be able to both carry and clear the ball, creating a unique flex point in the center strings so that the ball can be felt when cradling. 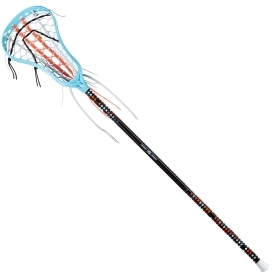 The top choice of elite defenders at right around $120 for this womens lacrosse stick. An interesting choice for the elite girl’s lacrosse player that needs longevity out of a stick that does it all. A widened head allows for maximum scoop and channel for cutting down passes and defense, but also is created with a flexible pocket that hugs the ball when cradling, ideal for the midfielder who sees a lot of defensive and offensive action. Pocket design keeps the ball in the sweet spot for quick releases on passes and shots. A good yet different choice for the midfielder looking for something unique, outside of the typical STX or Brine stick. Can be found for around $90. Coming fully strung, this womens lacrosse goalie heads for girls is an awesome bet for intermediate to advanced laxers out there. 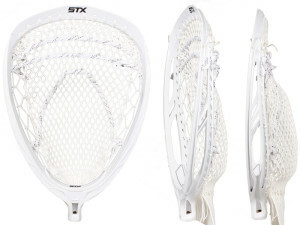 A definite step up from the Goalmaster lacrosse goalie head, the STX Shield is now lighter and better than ever. If you play competitive high school or Divison 1 lacrosse, this is the girls lacrosse head for goalies who are the best of the best! In order to arm our nations youth players with the right tools learn the sport, manufacturers develop easy to use, skill developing, girls lacrosse sticks. 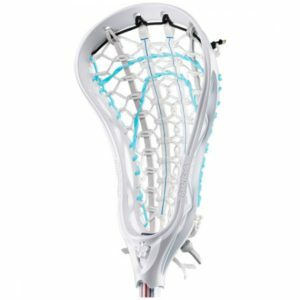 Manufacturers like Brine, STX, and deBeer have lines of girls lacrosse sticks that put the focus on catching, throwing, and scooping ground balls. With wider scoops and less off-set than womens lacrosse sticks, it allows younger girls to learn the essential skills of the sport without worrying about high-tech advancements that come with more expensive sticks from the same manufacturers. Once your little girl has learnt the basics of the game, you can get a more expensive version of the same stick from these manufacturers. 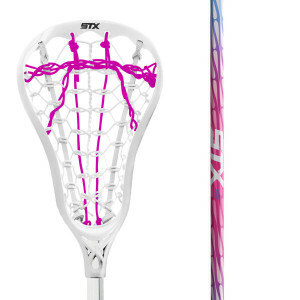 The STX Crux 100 girl’s lacrosse stick is the first stick in the Crux model. The models get newer and more advanced, so the Crux 100 is a great place to start for a beginner who will be progressing into the sport year after year. The Crux line is developed for the more midfield and attack minded, offering superior ball control in its narrower channel and “V” shaped scoop. The stick is very well liked by beginner and intermediate players, getting 4.5 stars out of 5. 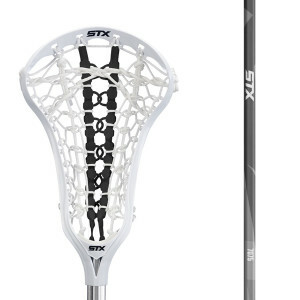 For only $50, this STX Crux 100 girl’s lacrosse stick will serve its purpose and then some. You cannot expect it to last for many seasons but it will definitely be a great stick for practice. With this young players will be able to learn how to exercise control on the ball and have a grip on the shaft. Developed by the same manufacturer that designs the girls lacrosse sticks of elite players, the Dynasty Rise was created to offer beginners the feel of an elite stick without forgetting all the assets that a beginner needs to truly learn the sport. 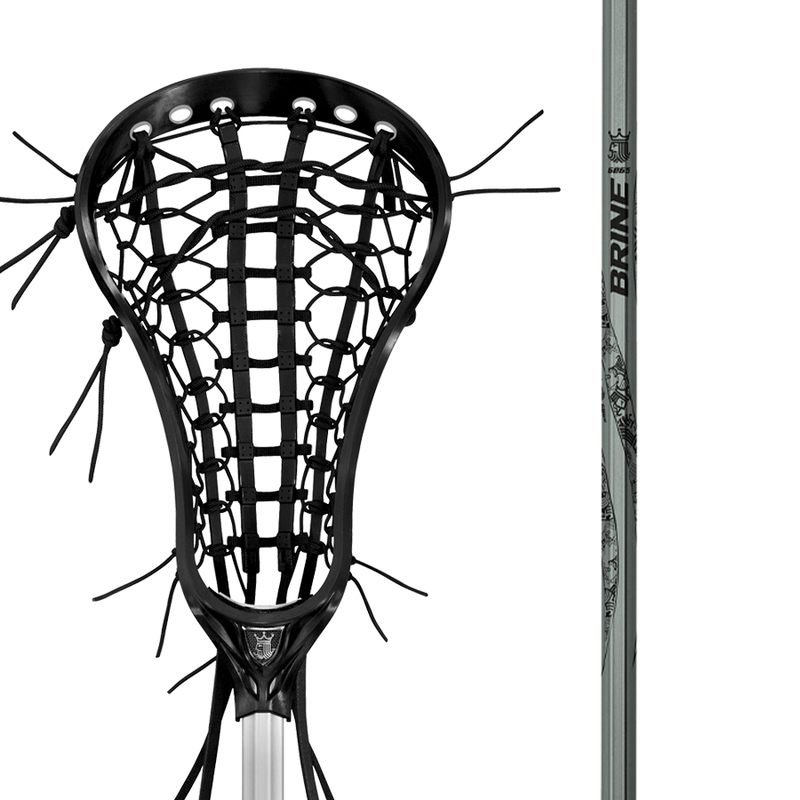 The Brine Dynasty girl’s lacrosse stick has low, offset sidewalls to allow beginners and intermediates to begin feeling the ball in their stick without minimizing control. The Dynasty Rise also offers one of the most widened scoops available, so that the beginners can maximize ground ball pickups, especially when new to the sport. Available for just under $40, the Brine Dynasty Rise is a great option for the girl’s lacrosse player who is serious, but new to the sport. At such a minimal price, this stick is a wise choice if you want to teach a young girl how to scoop a ball properly. 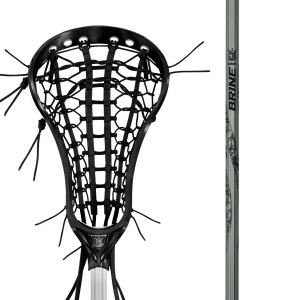 The model itself is a few years old but there have been little improvements on this great choice for the intermediate to advanced lacrosse player. The DeBeer Impulse girl’s lacrosse stick is light and responsive, designed with low, aerodynamic sidewalls that allow you to really feel the ball. The sidewalls allow for the ball to be placed in the middle so that it gets the most impact when you are shooting. The stringing has the gripper center channel, keeping the weight of the ball in the center of your stick, ready for a pass, shot, or cradle in a split second. Plus, the fact that it was released in 2013 means you can get it for cheap, at much less than a new 2017 or 2018 model. Starts at just around $50. 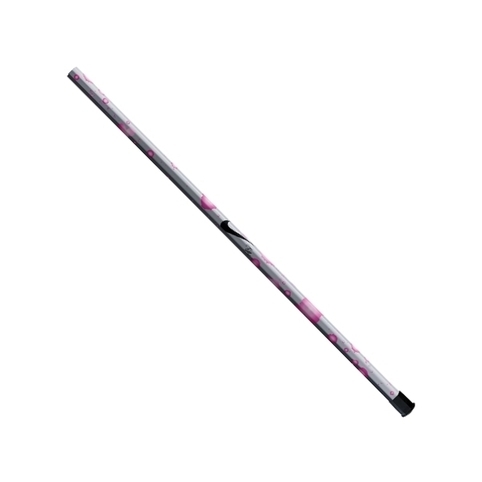 The STX Lilly girl’s lacrosse stick is the typical beginner stick. This stick is ideal for beginners and youth players, but almost too much of a beginner stick for the intermediate player. This girl’s lacrosse stick is designed with the widest possible scoop for ground balls, ideal for those who aren’t yet efficient in passing and catching. The channel in the middle of the stick is also wider, so that cradling skills can be developed and passes can be crisper. 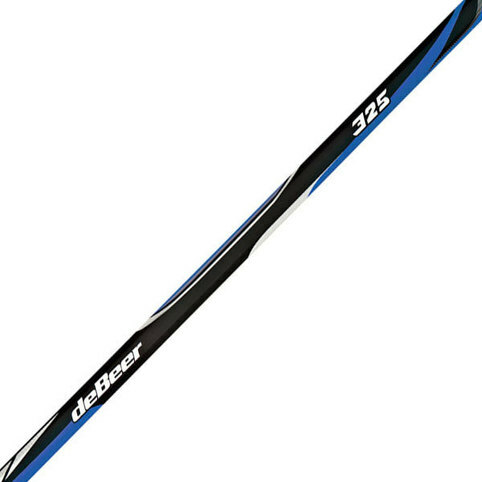 It’s definitely the type of girl’s lacrosse stick you start a youth player out with so that they can learn the basics, and not a bad price for $30, easily replaceable for when your youth player is ready to move on to a more advanced girls lacrosse stick. 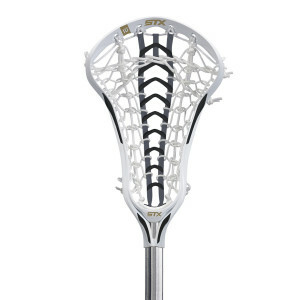 The Maverik Twist girls lax stick comes with a pocket developed to give the beginner more feel with the ball. The precision pocket is ideal for those who have mastered ground balls, passing, and catching, and now want to develop their shooting skills. The pocket is strung with heavy nylon, which offers more control around the ball within the pocket. This control is extremely important when you are learning how to shoot the ball. Priced at under $50, you can't go wrong with this lax stick for beginners or intermediate players. 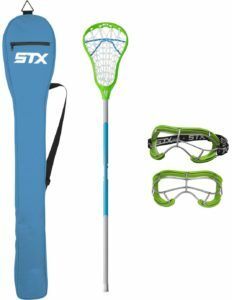 The STX Exult girls lacrosse starter package comes with the STX Exult stick, youth-sized 4sight goggles, and stick bag. It is the ideal package for the beginner or intermediate girl’s lacrosse player that needs to cover her bases with equipment. The Exult 200 stick is a decent beginner stick that offers widened surface area for ground ball pickup, and optimal sight protection with the 4sight goggles. Available in a few colors, we found it in pink for $85. 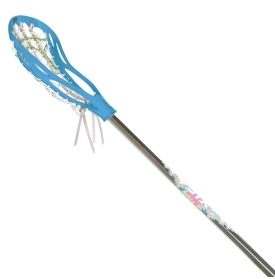 Complete with the Maverick Twist Girls Lacrosse Stick with flexible swivel pocket to offer the youth player flexibility when learning to carry the ball. The Twist girls lax starter package also includes the coveted Poly Pro goggles, which has the best possible sightline to the ball with its one-lined eye protection. The Maverick Twist package also includes a lacrosse backpack style bag, which is becoming more common and desired among youth players. We found it in carolina blue and pink for $80. No matter what position you play, there is a girls lacrosse stick out there designed with you in mind. The best way to get a feel for what you need is to try out the sticks of your teammates, coaches, and mentors. While you may get used to one stick over time, you might not be performing at the top of your game without a stick that is designed for your position, especially at a higher level. Trying out newer, more advanced lacrosse sticks for girls will keep you performing at the top of your game season after season! It is always good to keep your choices open. You never know when you will hold a stick that belongs to another player and love the way it fits in your hand. Girls or Womens lacrosse stick choice should depend on your ability, position, and cost, but don’t let those be just the deciding factors. Choose the girls lax stick that feels right in your hands, and the best thing you can do is try out your teammates sticks as well. There are pros and cons to every option but the stick that can get you through a long season with little wear and tear is going to be your best bet. You can be the best at the game but if you are not comfortable with your stick or if the stick you are using is not top notch, you can never give your best play. A stick can make or break a new or even elite player, so get the stick that is right for you!